Yesterday was a cloudy and rainy and the weather caused me to have a little homesickness (I miss rain), and we all know the best cure for anything is to get creative. Right? Wash and dry your fabric without fabric softener or dryer sheets, to remove the sizing. Then iron it out and cut it to the desired length and width, leaving an inch on each side for the seams. 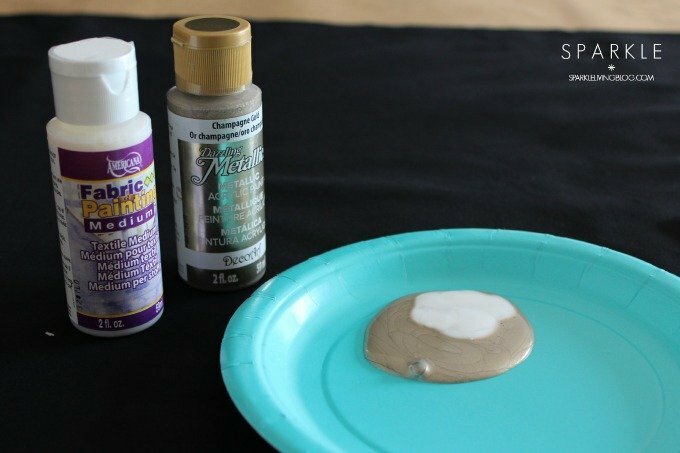 Using a palette or paper plate, mix 2 parts paint to 1 part fabric painting medium. 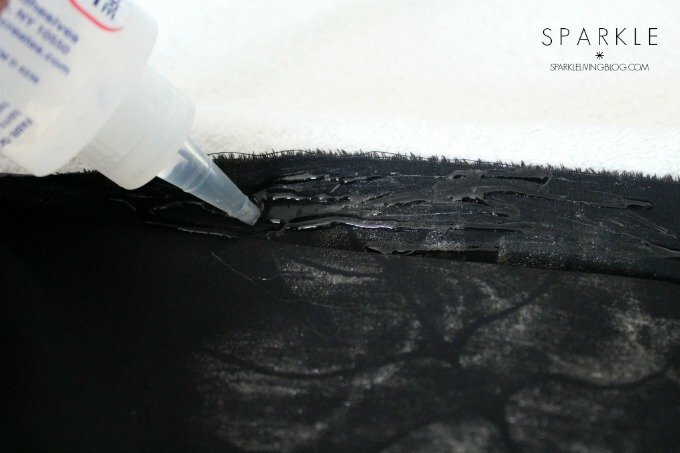 Be sure to cover your work surface, because the paint can seep through. Place the stencil down, hold it in place with one hand, and dab the pouncer in some paint, then pounce the paint on to the stencil. Make sure the paint is even on the pouncer and not too thick. Once done, lift the stencil directly off and repeat randomly on the fabric. 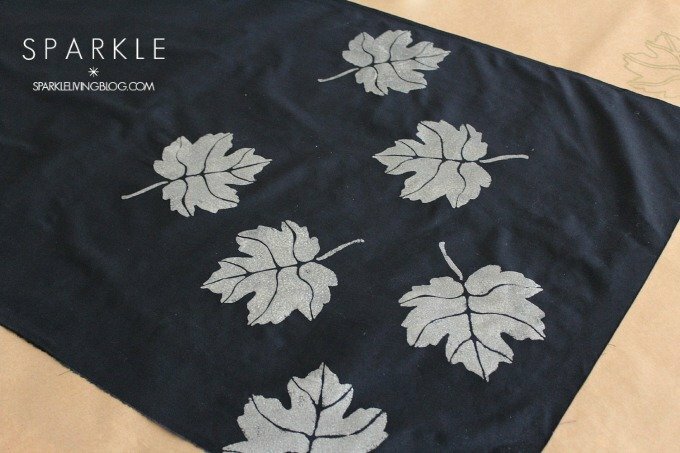 After painting a couple of leaves, either rinse the paint off the stencil, or wipe it off with a baby wipe (that’s what I do.) You don’t want the paint to goop up your stencil. 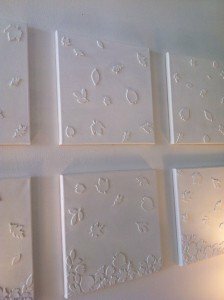 Once you’ve stenciled all the leaves on. Let the table runner dry for 30 minutes. After that, you need to heat set the paint. Do this by ironing the wrong side of the fabric, constantly moving the iron about the fabric. At this point, you want to iron your seams down. I folded over an inch on each side and ironed it flat, making sharp angles at each corner. With the seams ironed down, I started applying my Fabri-Tac. Being careful that I didn’t use too much (you don’t want it to soak through) I applied the glue in 6 inch sections. Gently press the seam down, not too hard though, so it doesn’t soak through. Then continue to glue, until the whole table runner is done. Flip it over and you’ve made yourself one gorgeous and easy piece of fall decor! The paint is washable with the fabric medium, but I’m not sure how the Fabri-Tac will hold up, so I would spot clean only. 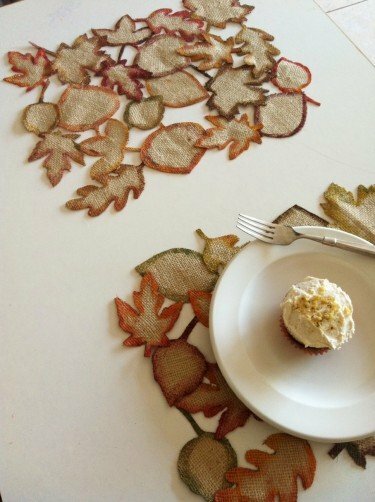 This is the most perfect fall table runner ever. i am so pinning this! Thanks Alyssa! I hope you make one. It’s too easy not to! That is BEAUTIFUL. 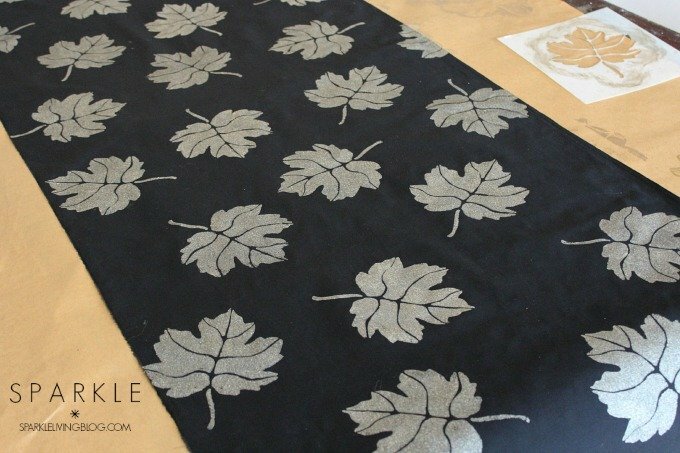 I love autumn leaf motifs and it looks so great in this understated monochrome way. Thank you Lix! I’m glad you love it. I’m so glad you love it , Fi! Wow, thats beautiful! I also love the falling leaves canvases! Thanks Melissa! 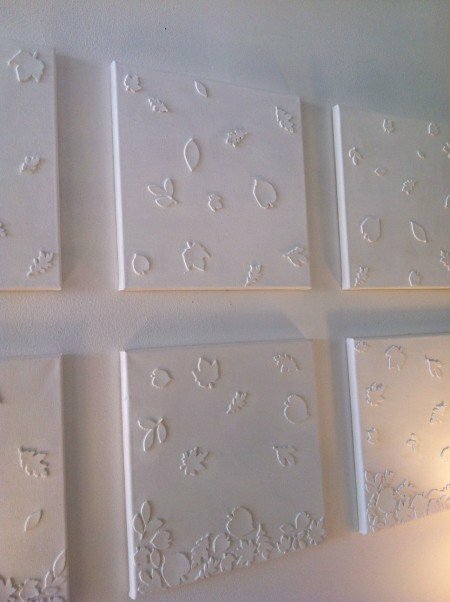 I really loved the falling leaves canvases too. I had made a falling snowflake one too. Erica, you should make one. It really only took 1.5 hours and it was so easy! Angelic, I hope you make one! I’d love to see your version of it. That turned out so nice, I love the black and gold! I love black and gold too! This gold is perfect because it’s not too yellowy. Thank you Andi! Thanks for the encouragement regarding sewing. I think I will get a inexpensive one and play with it until I’m comfortable. I have tons of fabric, mostly because I love the designs. It’s time I do something with it! Turned out absolutely GORGEOUS! Can’t wait to try these for every season with different colors and stencils! Thanks! I think that’s a great idea! I needs to start finding wintery stencils. 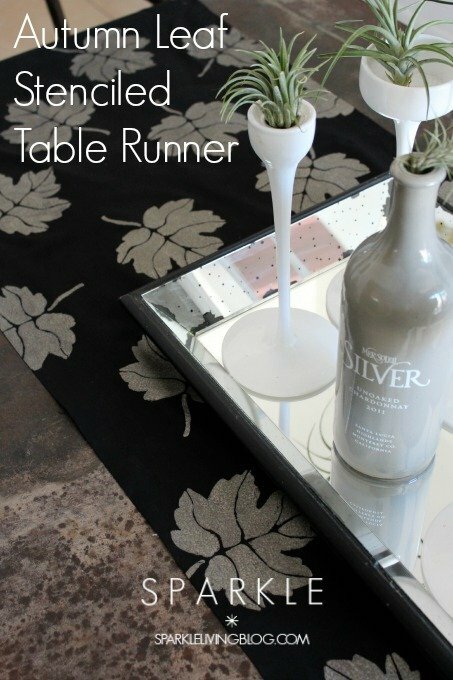 What a great table runner! It looks very simple and fast. I’m going to pin this! I hope you make one! This table runner is super cute! And I love how easy it is to make! 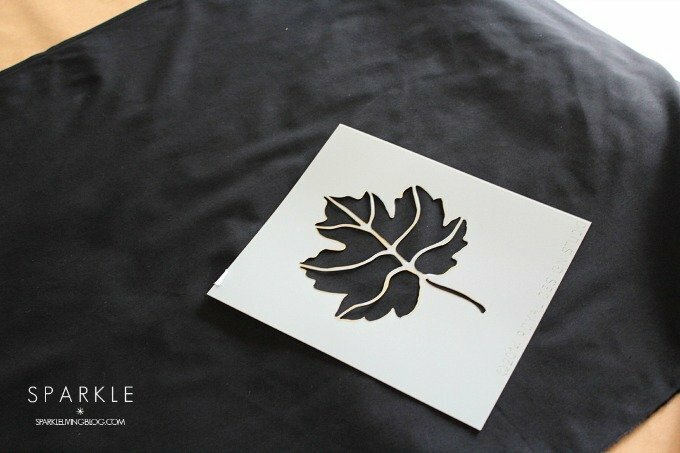 I think I even already have a leaf stencil already! It’s so easy! I can’t wait to see how yours turns out! I can’t believe that you made this yourself. It looks great! I can’t believe it either! Thank you! Very pretty! On a sidenote, I love the little plants you have! This is an AWESOME DIY! Thanks for sharing! I am obsessed with this! I don’t do crafts often but this might just make the list! That is awesome! I love that there’s no sewing involved, I could get my son to help! 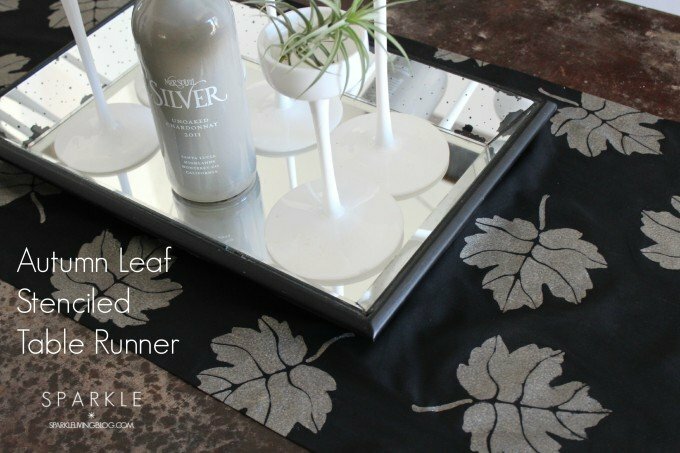 This table runner is gorgeous. I want to go make one now! Love the color you created by mixing them. What a cute and festive runner! Looks beautiful and surprisingly easy to do! Love the silvery effect – perfect for Christmas too! This is beautiful! Love that paint color! Thanks so much for sharing the how-to with us at Snickerdoodle Sunday! Pinned to share. I love how simple this is. Great idea to make your table perfect. Thanks for sharing with us at Family Joy Blog Link Up Party. So pretty! I haven’t done anything with stencils in quit some time…. I’ve been on the hunt for some new runners. I love using them on my buffet, but I just can’t find anything I love that doesn’t cost a fortune. Maybe I need to make my own!!! Thanks for sharing at Throwback Thursday! Thank you for the feature! I’m glad you like it!